Born on March 1, 1936, in the ancient ‘Sankarathil’ (Sankarapuri) family of priestly tradition – Kumbazha, Pathanamthitta, Kerala, India – to Sri. Kunjummen Mathai & Aliyamma, who called him Kunjunjukutty, the youngest of four brothers, no sisters. Mother died when he was 3 ½ years old and father died when he was 26 years of age. Began serving at the Altar (Madbaha) at the age of 12 with the blessings of the late H.G. Geevarghese Mar Philexinos Metropolitan (Puthenkavil KochuThirumeni), ordained Deacon on August 29, 1953 (the Memorial Day of St. John the Baptist) by the late H.H. Baselius Geevarghese II, the Catholicos, at the Devalokam Aramana, Kottayam; priested on August 21, 1970, by the late H.G. Daniel Mar Philexinos, Metropolitan of the Thumapamon Diocese; consecrated Cor-Episcopos at the age of 44, in 1980 – the first Cor-Episcopa of the American Diocese- on April 26, 1980, at the home parish, St. Mary’s Valiya Cathedral, Kumbazha, by the late H.H. Baselius Mar Thoma Mathews I, the Catholicos of the East. Served many years as secretary to the late H.H. Baselius Geevarghese II, the Catholicos, Augen I, when H.H was Metropolitan and as the Catholicos of the East, stayed with H.H. 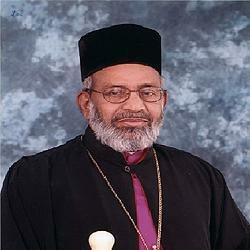 Baselius Mar Thoma Mathews I, served as Editor of ‘Malankara Sabha’ the official organ of the Malankara Orthodox Church. Widely acknowledged as a learned Theologian, a prominent convention speaker and retreat father and eminent organizer; came to the USA on September 12, 1970, for higher theological studies at the Union Theological Seminary, New York. Immediately after graduating S.T.M. from the U.T.S.Seminary, he was appointed by H.H. Baselius Augen I, the Catholicos – the first appointment of one of our priests in the USA – on August 2, 1971, to organize parishes for the Malankara Orthodox Church in the USA. Organized the St. Thomas Orthodox Church, New York (at present The St. Thomas Orthodox Church, Yonkers). Since the recognition of this parish as the first parish in the USA by the Metropolitan of the Outside Kerala Diocese, H.G. Mathews Mar Athanasios (later H.H. Baselius Mar Thoma Mathews I, the Catholicos), served as its vicar until 1977 (the first vicar of the Malankara Orthodox Church in the USA). Founding father of St. Gregorios Parish (Elmont), served as its vicar until April 1986. Founding father of St. Thomas Orthodox Church, Detroit and organized the St. Thomas Orthodox Church, Washington D.C., served as vicars for both. Also served as priest at the St. George Orthodox Parish, Staten Island. He conducted the Holy Week service in Philadelphia for the first time (1971),and that led to the inception of St. Thomas Orthodox Church in Philadelphia. Founding father of St. Thomas Orthodox Church, Long Island, New York, serving as its vicar since its inception in April 1986. Preliminary education at Kumbazha, high school at Pathanamthitta Catholicate H.S. B.A. (Economics), M.A. (Malayalam & Sanskrit) Kerala University; G.S.T. (Theology), Orthodox Theological College, Kottayam, Kerala; S.T.M. (Theology), Union Theological Seminary, New York; M.S. (Counseling Psychology & Family Counseling) Long Island University, New York; M.T.R. (Therapeutic Recreation), New York University, New York; M.S. (Rehabilitation Counseling), Hofstra University, New York; D.Min. (Doctor of Ministry), Canada Christian College, Toronto, Canada; A.C.P.A Trained Chaplain (Clinical Pastoral Counseling); and Certified Drug & Alcoholism Counselor. The New York Union Theological Seminary honored him with the title ‘Ecumenical Fellow’. Employed with the New York State Psychiatric Hospital from 1975 until his retirement in 2000, now fully engaged in church and community activities. Played a vital role in the formation and growth of the American Diocese of the Malankara Orthodox Church; served as the Diocesan Council member, the first Secretary of the Clergy Association of the American Diocese, present Secretary of the Clergy Association and Managing Committee member of the Malankara Orthodox Syrian Church. Served in 1979 as General Convener of the reception committee that made arrangements for the five-week American visit of the Catholicos of the East, H.H.Baselius Marthoma Mathews I and stayed in our residence while His Holiness was in the USA. That was the first visit of a Catholicose of the Malankara Orthodox Church to the USA. Author of many articles. Patron of Sankarathil (Thalanad) Family. Married to Elcy Yohannan Sankarathil, (Engineer-retired., Nassau County DPW), daughter of the late Mrs. Thankamma & Mr. T.G. Thomas, Thazhethil) Mundappallil (Rtd. High School Head Master), Kadampanad, Adoor, Kerala. They have 2 sons.